LAGOS—Operatives of the Rapid Respond Squad, RRS, of the Lagos State Police Command, weekend, arrested 11 suspected members of a robbery gang that specialized in attacking fun seekers at the National Theatre and other parts of Ijora area of the state. ARRESTED: Some of the suspects arrested in connection with the robberies at the National Theatre and Ijora area of Lagos State. The suspects, as gathered, attacked a female trader, dispossessed her of N250,000 Saturday, while other unsuspecting fun seekers had their valuables forcefully taken away. The gang was at the verge of attacking another group of ladies when RRS operatives swoop on them. Sighting the policemen, the robbers took to their heels, but one of them, Onuwa Friday, who was recently released from prison, was arrested. Police sources hinted that an empty hand bag, later identified as that of the trader, was recovered from Friday. Sources said the suspect’s confessional statement led policemen to the gang’s hideout around Ijora bridge, where 10 other suspected members of the gang were apprehended. 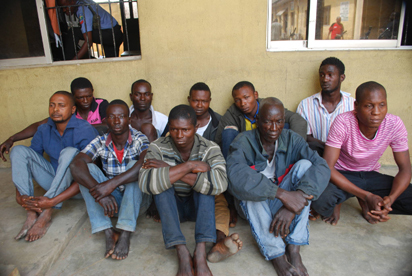 The suspect told Vanguard: “We went to Costain, opposite the National Stadium to rob. It was Kowasibe (another member of the gang) that accosted the lady in whose bag we found bundles of naira notes in N500 denomination. Kowasibe was the only one armed. The gun was used to scare our victims.